Florida is well known for its magnificent beaches and entertainment parks, but it also has a large number of magnificent lakes that provide respite from busy daily lives, places to come for the winter for the snow birds, great spots to catch some prize fish and spectacular environment for water sports – kayaking, canoeing, sailing, and nature observing. Some large and other small, all Florida lakes are fairly shallow and full of fish. Crescent Lake in northeastern Florida stretches over 15,960 acres and is best known for its beautiful scenery and clean water. At the lake’s south end is the 3,528-acre Crescent Lake Conservation Area, which provides water storage for the lake and protects wildlife. You can frequently see bald eagles, waterfowl, and osprey. Between the Conservation Area and the nearby Haw Creek Preserve, visitors have lots of opportunities for fun; activities include hiking, horseback riding, biking, and simple camping. There is, of course, fishing on the lake, and a good angler can easily go home with bass, catfish, crappie, and panfish. Nature photographers have a field day on the lake where scenery changes around every corner and picturesque bold cypresses provide many photo opportunities with bold eagles ascending from their perches. There are also kayakers, canoers, and bass boaters enjoying the lake tranquility. No motorboats are allowed. Cypress Lake is 4097 acres of clear water located in Osceola County, one of several lakes that make up 56 miles of the Kissimmee Waterway. All lakes are shallow, often only six feet in depth. A trip to Cypress Lake will put you in a relaxed mood even before you arrive at its lush surroundings rich in diverse wildlife. The lake serves as the wintering ground for many waterfowl, and bald eagles, red-shouldered hawks, and elegant herons create quite a show for the avid nature photographers who frequent the lake. Airboat rides are the most popular means of exploring the lake, and there are many boat tours that will introduce you to the lake’s diverse wildlife. Fishing on Cypress Lake is superb; you’ll find black crappie, largemouth bass, and bluegill. Visitors can bring their own boat or rent one on the lake. Whether you catch something or not, you will surely enjoy a lovely day on the tranquil water with sun in your face and a cold drink in your hand. Located north of Panama City, Deer Point Lake mostly serves as a source of public water, but also for irrigation and recreation. Stretching over 4,572 acres of water with subtropical temperatures and lush nature, Deer Point Lake is a popular getaway location and a great spot to enjoy fishing, camping, canoeing, and much more. The lake is an important watershed for wildlife and fish and a nesting ground for osprey. Deer Point Lake is also a popular fishing destination and is known for its shellcracker. There are two fish camps at Deer Point Lake and a number of simple primitive campsites. 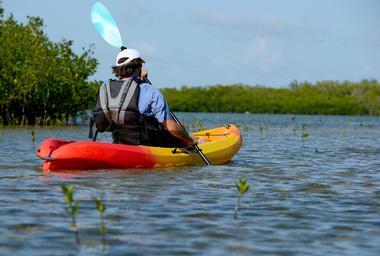 There is an interesting 22-mile-long canoe trail on Econfina Creek. Its upper portion has a number of rapids, offering quite a challenge even to experienced canoeists. 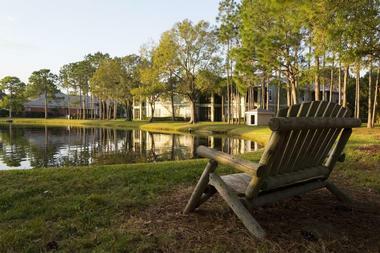 East Lake Tohopekaliga, or East Lake Toho as it is popularly called, is located south of Orlando in central Florida. The lake, which is circular in shape and covers 11,968 acres, is the second largest lake in Osceola County. East Lake Toho is part of the chain of lakes on Upper Kissimmee River, together making the headwaters of the whole Everglade system. There are three communities on the lake: Narcoosee, St. Cloud, and Runnymede. 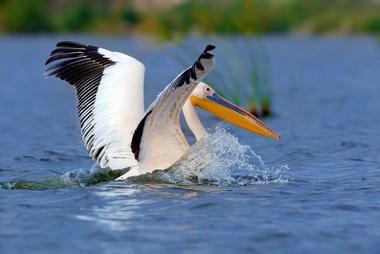 The spectacular beauty of the lake brings large number of tourists every year. Clear water and depths of up to nine feet create the perfect environment for all sorts of outdoor activities. The best way to explore the lake is on an airboat, a flat-bottomed boat that glides smoothly over even the shallowest of water, bringing visitors very close to the wildlife that calls the lake home, alligators being just some of them. Nearby Chisholm Park has nice picnic areas, kids’ playgrounds, ball field, a volleyball court, a ramp for boats, and a nice sandy beach. Avid fishermen come for black crappie, catfish, bluegill, redear sunfish, and especially largemouth bass. 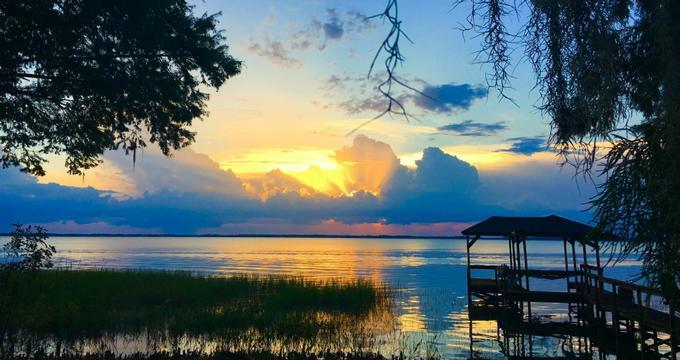 Located between Orlando and Clermont in central Florida, Johns Lake is a scenic 2,419-acre lake divided into east Black Lake and west Clear Lake, connected through a series of channel. Fairly shallow, the lake washes up on a winding coast that forms many coves and islands, making it great fun to explore by boat. The coastline is mostly undeveloped, with a few private residences that are peaceful and unspoiled. Bass fishing on Johns Lake is the reason so many fishermen flock here. The lake’s irregular bottom and the fluctuations in water level create a perfect habitat for largemouth bass. Besides bass, there are also black crappie, bluegill, and shellcracker. There are several campgrounds nearby but no campgrounds on the lake. Just north of Johns Lake is the Oakland Nature Preserve, a 120-acre park that offers wonderful hiking trails and a 3,000-foot long boardwalk stretching deep into the native wetlands. There are also a number of first class golf courses nearby. Known as a world-class bass fishery sixty years ago, Lake Apopka was known for its clear water and was surrounded by a number of fishing camps. But, agriculture, a construction of the levee on the north shore, and municipal waste from Winter Garden turned it into a pea green-colored lake with dead fishing frequently floating to the surface by 1980. 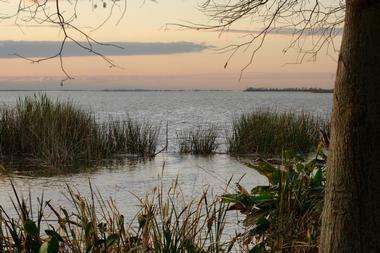 In 1985 the Lake Apopka Restoration Act began the lake recovery. The USDA and the St. Johns River Water Management District brought back most of the farmland and flooded the lake. Unfortunately, the level of pesticide in the fish was so high that it killed all the birds that ate fish, so the lake had to be drained again. Today, a "marsh flow-way" system filters the lake water, improving its quality and encouraging the return of native plants and with them the fish. There are several nature preserves in the area and three nice hiking trails as well as a 2.9-mile long equestrian trail. Blue Cypress Lake, located about 20 miles from Vero Beach, stretches across 6,555 acres and is known for the cypress trees that surround the lake, giving it a bluish glow in the bright morning sun. 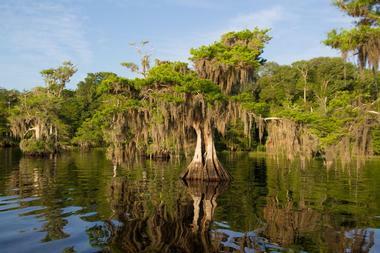 Blue Cypress Lake is the headwater of the St. Johns River, which ends at the Atlantic Ocean. The lake is surrounded by 29,000 acres of swamps, marshes, and cypress forests and is about seven miles long and three miles wide. Blue Cypress Park on the lake's west bank has two boat launches, two covered pavilions, a floating dock, and simple camping. It is a popular spot for canoeing and hiking. Never deeper than nine feet, the lake is not great for swimming, but it is heaven for fishermen. The lake is full of bluegill, chain pickerel, catfish, largemouth bass, crappie, shellcrackers, and warmouth. Middleton's Fish Camp, the only fish camp on the lake, offers cabins, tent camping, boat rentals, a bait shop, a boat ramp, and a picnic area. The lake’s lush nature, which includes 130 feet tall cypresses covered in green moss and lively wildlife, makes it great for nature photographers, and the large expanse of clear water is very attractive to kayakers. Lake Como is an unusually clear and blue lake in Putnam County in Florida. It is home to very few plant and fish species. 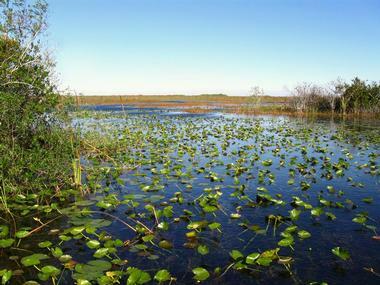 Spread over 245 acres and with an average depth of 10 feet, it is fairly deep for a Florida lake. To the east is the large Lake Crescent and to the north Dunns Creek, which eventually turns into St. John’s River. To the west of the lake is Welaka State Forest, a beautiful forest that provides a protected habitat for plants, birds, and animals. The park has campsites, several picnic areas, a dining hall, and many nice hiking trails. The best known trails are the Mud Spring Trail and the Sandhill Horse Trail. Nearby is the Welaka National Fish Hatchery and Aquarium, covering 54 acres of water. The organization raises striped and largemouth bass and sturgeon. The aquarium is part of the local school education program. You can also find an observation tower and a 3/4-mile interpretive trail, both popular with birdwatchers – the park is home to cranes, white ibis, bald eagles and ospreys. 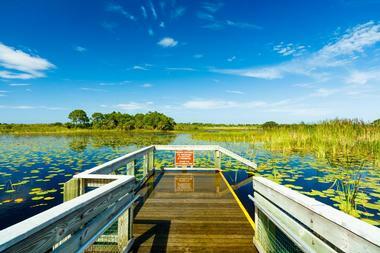 Located in Eastern Central Florida, Lake Dora is part of the Harris Chain of Lakes. Very large, it is teeming with wildlife and full of fish, with miles of waterways for the boaters to cruise and enjoy the peaceful surroundings. Since it is only a half hour from Orlando, it can get busy with people escaping Orlando’s business. In the past, Lake Dora was famous for first class bass fishing until about twenty years ago when agricultural run-off made it too polluted for fishing. Massive effort and huge expense greatly improved water quality and returned most of the former agricultural land to the wetlands. The bass fishery is back, and bass fishermen can also catch black crappie, catfish, and bluegill. The lake is great for water skiing, jet skiing, canoeing, kayaking, and wind surfing. 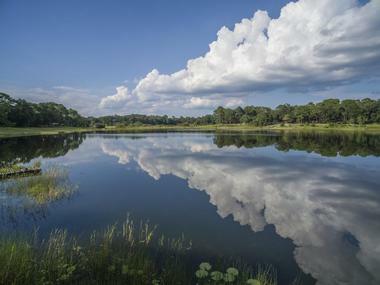 Lake Eustis spreads over almost 8,000 acres and is part of the Harris Chain of Lakes, an important body of water in the Ocklawaha River watershed. The lake shore and surrounding area provide home to about 50,000 residents, some living on the lake year around and others known as “snowbirds” coming south for the winter, many in their RVs. 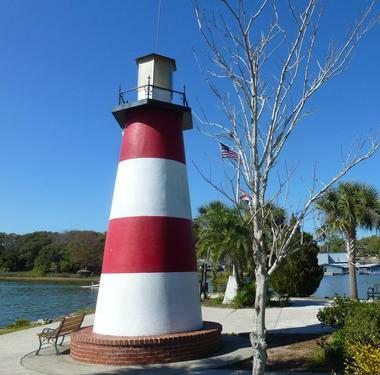 While about one quarter are retirees, Eustis and Tavares, the two small towns on the shoreline, are also home to many artists and retired professionals, making the area lively and interesting. 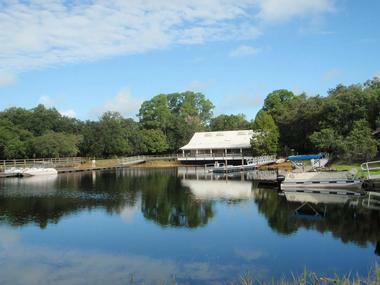 Lake Eustis is excellent for power-boating, water skiing, jet skiing, and sailing. There are two marinas and two boat launch sites, and a local sailing club organizes regular racing events, teaches sailing, and sponsors regattas. The lake is also full of bass, catfish, crappie, bluegill, and sunfish. Canoes and kayaks are great modes of transportation to enjoy the lake in peace and observe wildlife, particularly birds in the Trout Lake Nature Center. 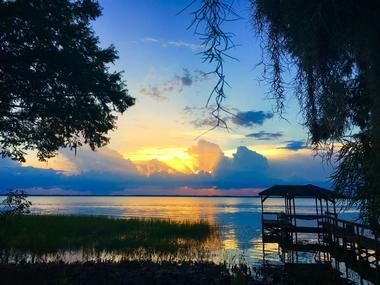 About 12 miles long, six miles wide, and stretching over about 46,000 acres, Lake George is the biggest lake on the St. Johns River and one of the largest in Florida. Although large, the lake is shallow, ranging between three and 12 feet. The lake is fed by St. Johns River on its way to the Atlantic, and the slow flow of the river brings some of the ocean’s salty water into the lake. Brackish water supports a large variety of plants and both saltwater and freshwater fish. The lake is surrounded by fish camps and is very popular among fishermen who are mostly attracted by the lake’s largemouth bass along with striped bass, bluegill, and crappie. Salt water means crabs, and the area’s large blue crab fishery is an important part of the local economy. At low rainfall, many saltwater species such as stingrays and even sharks make their way to the lake. Bordering the lake’s western shore is the Ocala National Forest, and the Lake George Wildlife Management Area is on the lake’s eastern shore. Lake Griffin spreads over 9,500 acres and is the headwaters of the Ocklawaha River. This shallow and long lake is located at the end of the Harris Chain of Lakes. The whole chain has heavy boating traffic, and anything can be seen on its waters, from kayaks and canoes to power boats pulling skiers and pontoon boats. 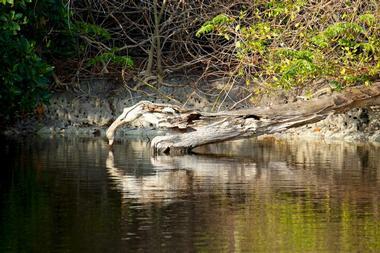 A big part of the lake’s shore remained natural, providing an opportunity for boaters to see local wildlife. There are two marinas on the lake, along with slip space, fishing supplies, and fishing necessities and a number of boat launch ramps. Fish camps dot the shoreline and are frequented by boaters and nature photographers who come to the lake to observe wildlife. The Lake Griffin State Park and Recreation Area has a small campground with lovely shade under live oaks. There is also a number of hiking trails in the park. Fishing is one of the most popular activities, with largemouth bass, crappie, catfish, bluegill, and sunfish as the main catches. The largest lake in the Harris Chain at 13,788 acres, Lake Harris is located only 31 miles from Sea World, Disney World, Universal Studios, and everything else Orlando has to offer. Its southern and eastern banks are filled with private homes, citrus orchards, and some wetlands. The northern side is a mix of industrial, commercial, and private use. There are two boat ramps on the lake on the western side and on the southern side in the county park. The lake can also be accessed from the Palatlakaha River and Lake Eustis, both offering a scenic ride through ancient cypress trees. Lake Harris waters can get very rough because of the lake’s large size and times when strong wind picks up. At times, boaters and anglers have to look for a safe harbor at Little Harris Lake at the southeast end. 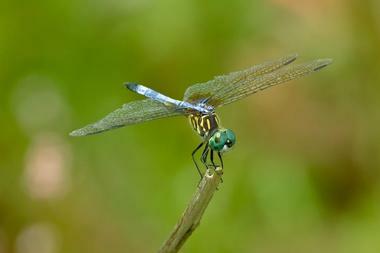 Hilly surroundings and a large size create a very beautiful environment rich in wildlife. Bold eagles and hawks are common sights. The lake is full of fish and is considered a prime fishing location. A shallow 5,757-acre lake located northeast of Tallahassee, Lake Iamonia is not ideal for swimming. With an average depth of five feet, it is more suitable for frogs and wading birds. It is a prairie lake, meaning it drains out during the dry season. Its fertile bottom provides excellent conditions for the growth of all kinds of water plants, and it serves as a great breeding ground for fish. Fishing is naturally the most popular sport on the lake, which is rich in prize bluegill, largemouth bass, and black crappie. 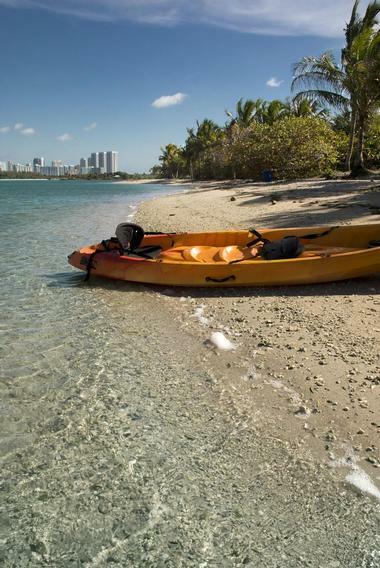 A slow trip in a canoe or kayak is also great way to spend the day on the lake. You might be lucky enough to spot white-tailed deer, turkeys, or an alligator lying peacefully in the sun. 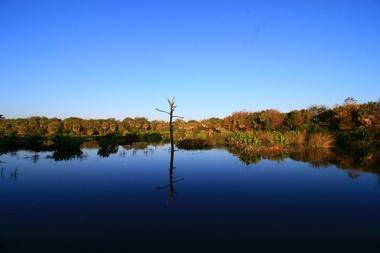 Located in Highlands County, Lake Istokpogais stretches over 27,692 acres. It is 10 miles long and five miles wide with banks full of interesting nooks and crannies to explore. Though fairly large, the lake has an average depth of about four feet with ten feet at the deepest parts, providing some danger to the boaters. Air boats, pontoons, and bass boats are the safest for fishing. Regardless of the shallow depth, there is quite heavy boat traffic on the lake, and there are a few boat ramps scattered around. Lake Istokpoga is teeming with black crappie, bluegill, sunfish, and largemouth bass. A number of fish camps around the lake have campsites with cabin rentals, hookups, and fishing trips. The lake is also home to a large number of bird species such as snowy egrets, bald eagles, and ospreys. With over 451,000 acres, Lake Okeechobee is the largest lake in Florida, but surprisingly has an average depth of only nine feet. The lake is part of the 154-mile Okeechobee Waterway, a huge body of water that connects the Gulf of Mexico with the Atlantic Ocean. 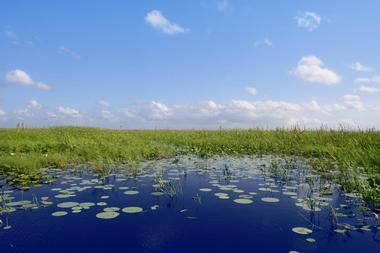 Lake Okeechobee is a natural lake, probably a leftover from the receding ocean some 6,000 years ago. 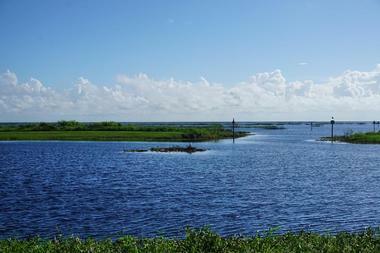 Fishing at Lake Okeechobee is very good, especially for catfish, largemouth bass, crappie, and speckled perch. There are several big fishing tournaments held on the lake throughout the year. 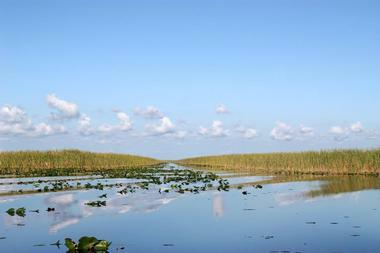 Most visitors explore the lake from Clewiston, Florida, conveniently located on the lake's southern shore. The Sugarland Express tour takes tourists through local farms and mills. There is also a three-hour boat cruise, or you can join 110-mile Lake Okeechobee Scenic Trail that offers spectacular views of the lake below and frequent encounters with the area wildlife. Lake Seminole is a 37,500-acre water reservoir located more or less halfway between Tallahassee, Florida and Bainbridge, Georgia. The lake was created by damming the Flint and Chattahoochee Rivers between 1947 and 1957. Originally built for hydroelectric power and navigation, Lake Seminole is a beautiful vacation destination for many Florida, Georgia, and Alabama residents. 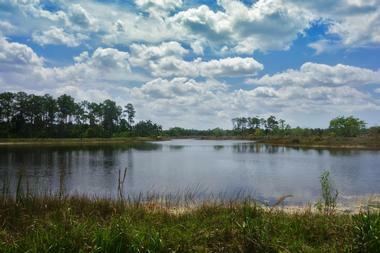 Along the lakeshore is Lake Seminole Park, which is rich in diverse wildlife, including threatened gopher tortoise. The park offers a network of scenic trails that are often busy with bikers, joggers, and roller bladers. They are shaded by dense pine flatwoods and colorful blossoms year around. The park also has a boat ramp and picnic areas with grills, tables, and playground. Only 10 feet deep, the lake is rich in fish, and fishermen flock to its shores to look for a prize bass, which might be a hybrid, largemouth, striped, or white bass. Lake Seminole is also famous for catfish, bluegill, and crappie. Only a few miles from Tallahassee is 8,800-acre Lake Talquin, created in 1929 by impounding the Ochlockonee River to construct the Jackson Bluff Dam and its hydroelectric plant. Rolling hills, stately forests, deep ravines, and all kinds of plant life surround the lake. This diverse environment provides home to a number of wildlife such as wild turkeys, bold eagles, Ospreys, deer, and much more. Next to the lake is Lake Talquin State Forest, a 17,491-acre diverse forest with longleaf pine, bald cypress, water oak, laurel oak, loblolly pine, life oak, mockernut hickory, swamp tupelo, red maple, and many other species. Lucky hikers can spot the occasional bobcat, gopher tortoise, and many other animals that find home in the forest. Besides great hiking through the forest, visitors can enjoy horseback riding, biking, canoeing, and kayaking, with so much beauty in and out of the water. Located close to the Florida’s Atlantic Coast, Lake Washington is one of the very few lakes to be used as a drinking water supply. With its large wetlands, Lake Washington is very popular among nature lovers, photographers, and fishermen. There are prize largemouth bass, bluegill, black crappie, and shellcracker (also called the red-eared sunfish) in its waters, and several fish camps are located on the lake’s shore. The most convenient boat to use on the shallow lake full of water plants is an airboat, and there is the ramp for boat launch at Lake Washington County Park. Lush, shallow, and beautiful, the lake is wonderful for slow kayak or canoe trip along its shores. The River Lakes Conservation Area includes a big chunk of the lake’s western shoreline. There are a number of simple campsites on the lakeshore. 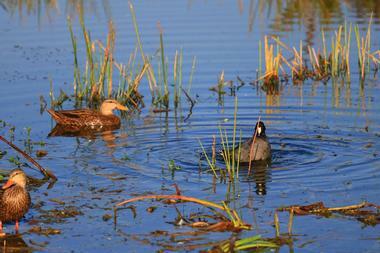 The wetlands provide home to a large number of raptors, wading birds, and waterfowl. 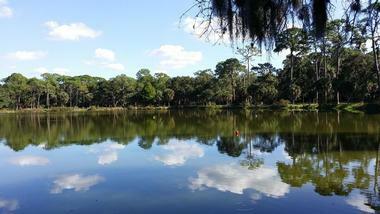 Lochlossa Lake is beautiful 5,700-acre lake in Alachua County, about 15 miles from Gainesville. Its shores are lined with huge old cypress trees draped in green moss alongside soaring oak trees. There is very little residential development, just unspoiled nature, peace, and quiet typical of a Florida in times gone by. 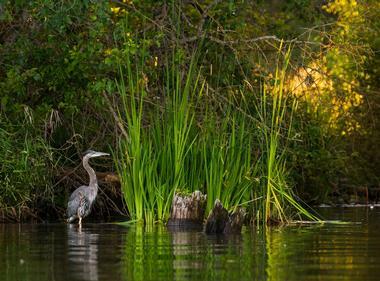 Most of the lake is surrounded by the Lochloosa Wildlife Conservation Area, which was created to protect the habitat of 19 endangered or rare species, including the east indigo snake and sandhill crane. The park is also a home to black bears, woodstorks, and osprey. The park’s 30,000 acres are intersected by scenic hiking trails and is popular for canoeing, kayaking, bird watching, and nature photography. 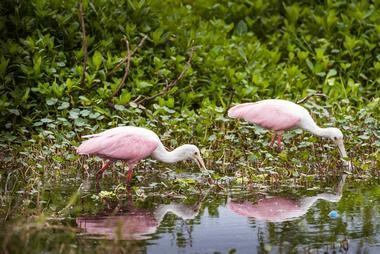 The Lake Lochloosa Wildlife Conservation Area is located on the Great Florida Birding Trail. Santa Fe Lake is a 5,850-acre expanse of water in northeastern Alachua County, Florida consisting of two lakes: Santa Fe Lake and Little Santa Fe Lake. 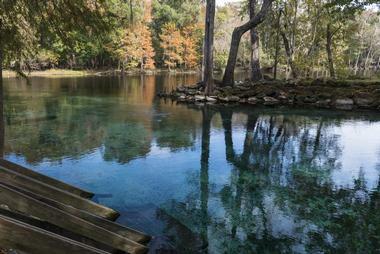 The lake is spring-fed, spilling into the Santa Fe River and eventually into the Suwannee River. There are a number of private docks along the lakeshore in the small towns of Earleton and Melrose. Santa Fe Lake Park has lovely hiking trails surrounded by breathtaking scenery. It also has a boat ramp and is popular among kayakers and canoers for a tranquil pass along its shores. Fishermen are always present on the lake because of its rich stock of black crappie, largemouth bass, bluegill, hybrid-striped bass, sunshine bass, and redear. The lake is shaded by magnificent old cypress trees with thick roots growing into the water depths and providing shelter for the thousands of native and stocked fish.